Our friend's Matt and Cat came to visit us for Memorial Day weekend. We had a really good time and were already making plans for their next visit before they even left! The first day we took a walk around the complex, went to the Stephens City/Newtown Festival, and had a cookout. The next day we headed out to the Shenandoah River State Park. It was beautiful. We went on about 3 miles of trails and got about 3 dozen bug bites! That night we went to dinner at one of our favorite restaurants, Glory Days Grill, to celebrate Matt and Cat's birthdays. Of course in between all our fun, we got in a few games on the Wii. It took all of 10 minutes, but Aunt Martha figured out the bird mystery. 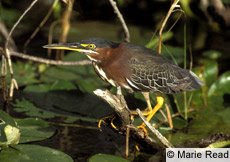 It is a Green Heron. Pretty cool I think. It seems that it was not quite full grown (a little smaller than a crow). Hopefully I will see it again this summer! :) Thanks Aunt Martha! Ben and I have been busy getting the house unpacked and trying to make the house feel like our home. So I thought it would be nice to take some "after" pictures to compare to the pictures I took a couple of months back. We are still in the process of fixing up a few things here and there, so as we complete our never-ending project list I will post more pictures...or you could just come see for yourselves :). Ben and I were very excited to be able to join Mom, Dad and Nathan to surprise Daniel at Ohio State for the Sphinx Senior Honorary induction last Friday. Mom and Dad received a notification back in early April stating that Daniel was to be inducted into the 103rd class of the Sphinx Senior Honorary. The induction was to be a surprise for Daniel as he was going to be "ambushed" by the current members and taken to the ceremony where his family would be there to see him. It turns out that they got a key to his room and yanked him out of bed at 7:00am for the induction. He is then "linked" with a current member who turned out to be one of the very first friends he made at Ohio State. I can't remember her name, but she was very nice. Daniel was completely shocked to see the family already there. And I must say, I have never seen Daniel smile as much as he did that day. He was absolutely beaming all day, as he should have been. We were all so proud of him. It was a really big deal that he was inducted into this honorary society. Only up to 24 students out of the entire Ohio State Senior Class are chosen, based on scholarship, leadership and their contribution to the school. Daniel deserved it. I think the Sphinx are lucky to have him. I am so proud of my brother.